You are currently browsing the category archive for the ‘puzzles’ category. A farmer has 40m of fencing. 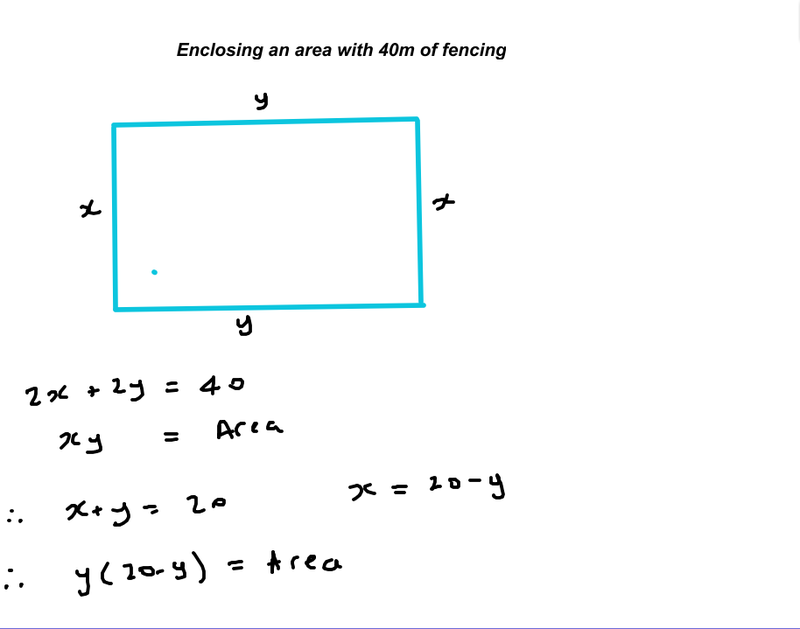 What is the maximum area he can enclose? 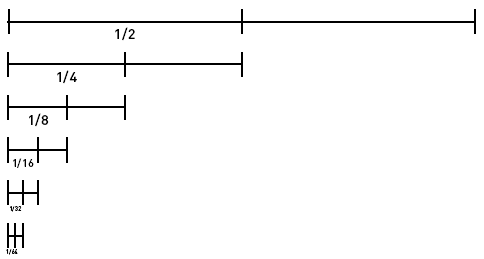 Reflection – the rectangle turns out to be a square, with sides 10m by 10m. 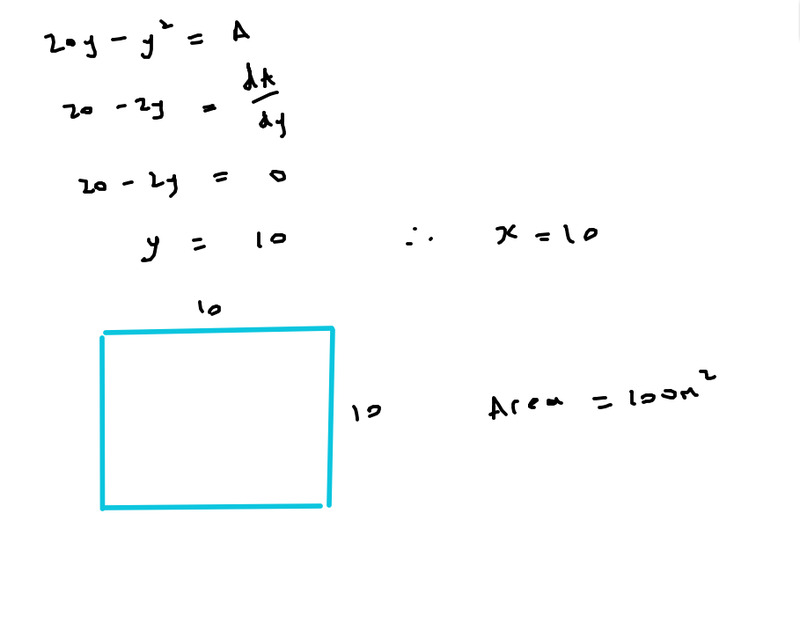 Therefore the area enclosed is 100 metres squared. Reflection: The area enclosed is greater than that of the square – this time we have around 127 metres squared enclosed. 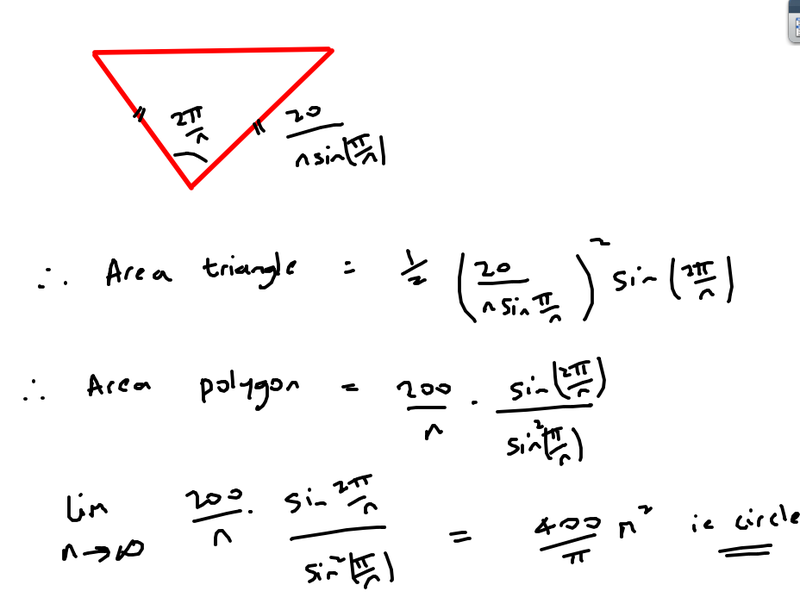 Reflection – our isosceles triangle turns out to be an equilateral triangle, and it only encloses an area of around 77 metres squared. 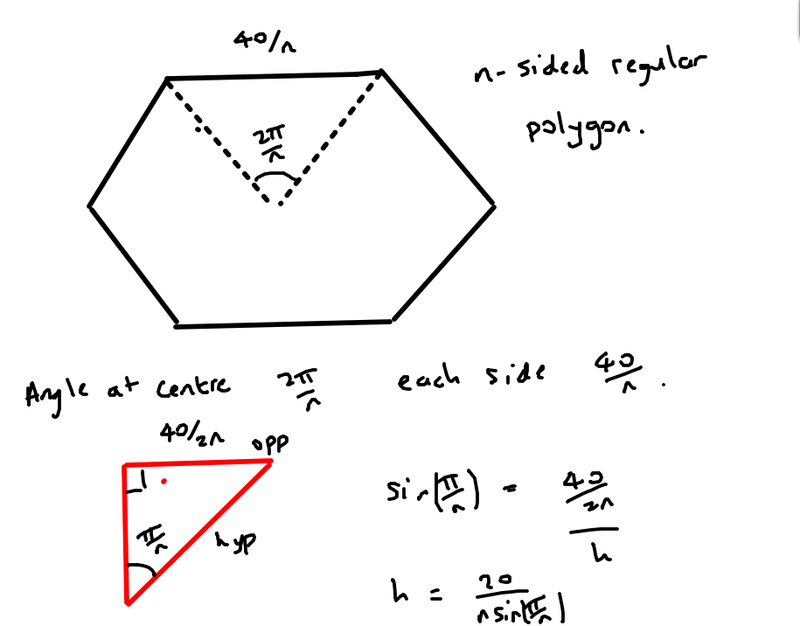 Reflection: Given that we found the cases for a 3 sided and 4 sided shape gave us the regular shapes, it made sense to look for the n-sided regular polygon case. If we try to plot the graph of the area against n we can see that for n ≥3 the graph has no maximum but gets gets closer to an asymptote. By looking at the limit of this area (using Wolfram Alpha) as n gets large we can see that the limiting case is the circle. 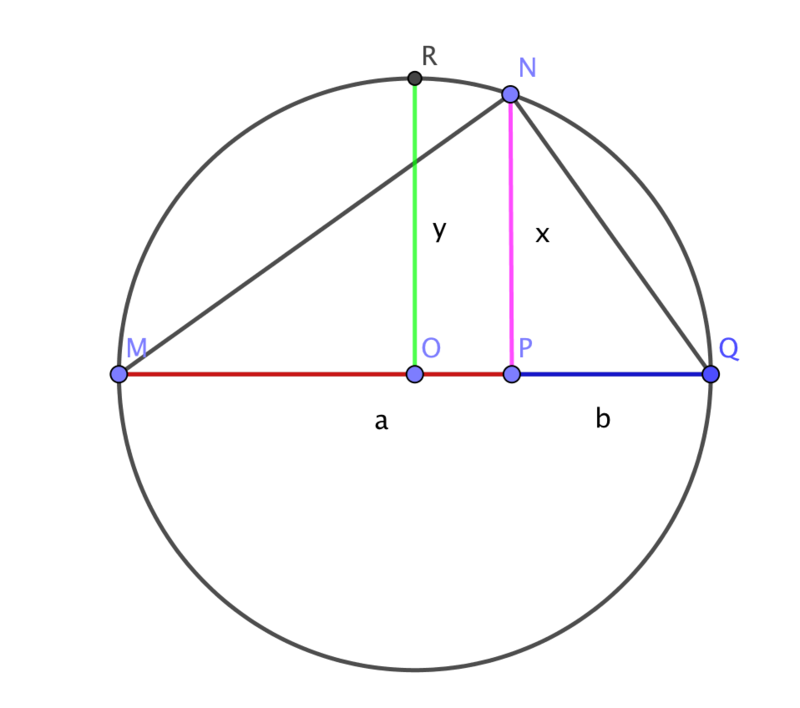 This makes sense as regular polygons become closer to circles the more sides they have. 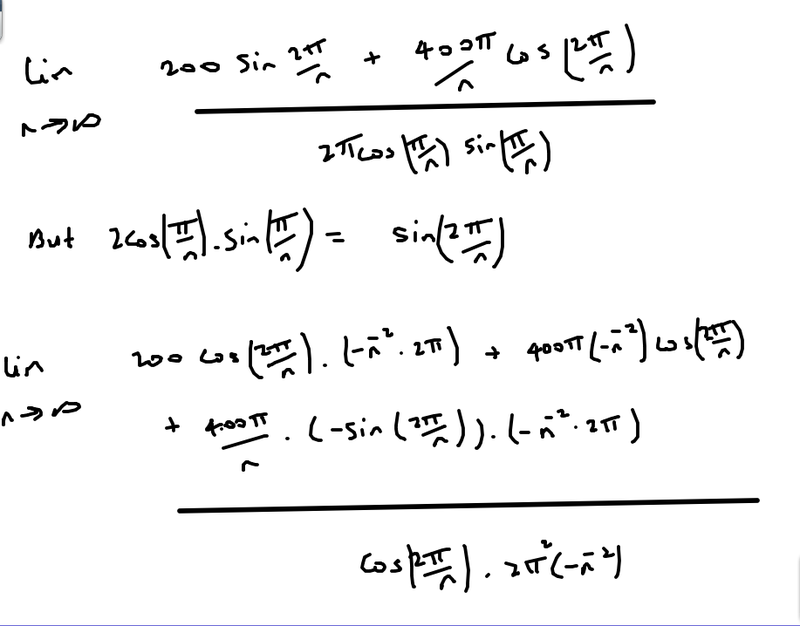 Here we can prove that the limit is indeed 400/pi by using L’Hospital’s rule. 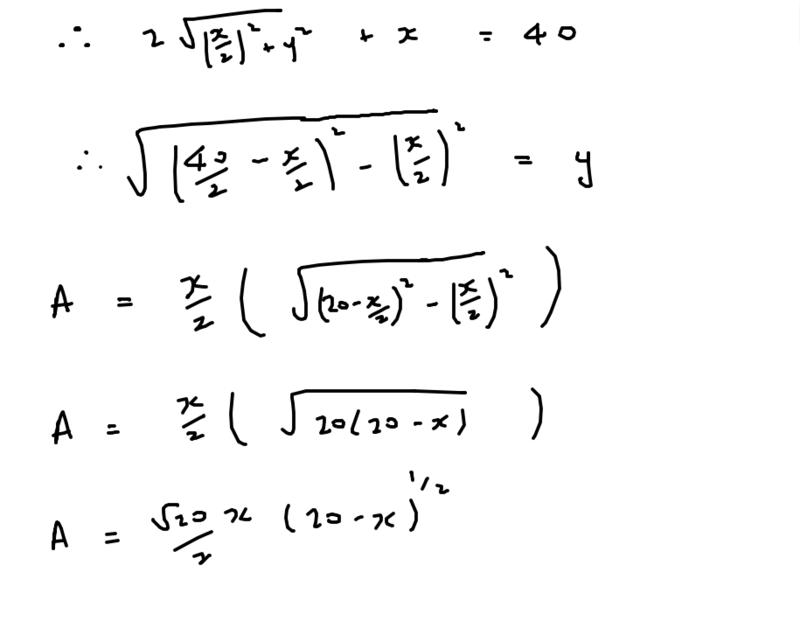 We have to use it twice and also use a trig identity for sin(2x) – but pleasingly it agrees with Wolfram Alpha. 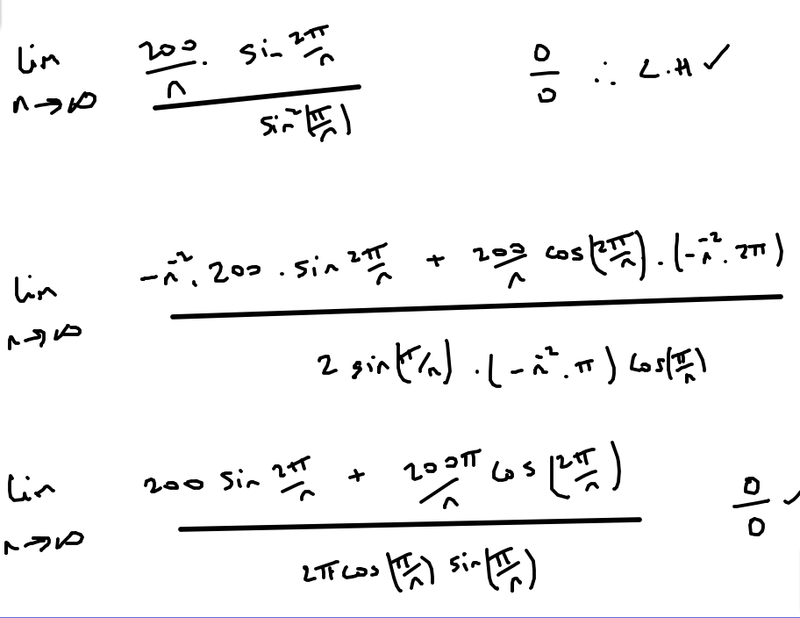 So, a simple example of how an investigation can develop – from a simple case, getting progressively more complex and finishing with some HL Calculus Option mathematics. 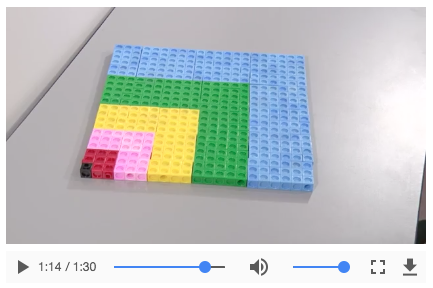 This is a nice investigation idea from Nrich. The above screen capture is from their Picture Story puzzle. 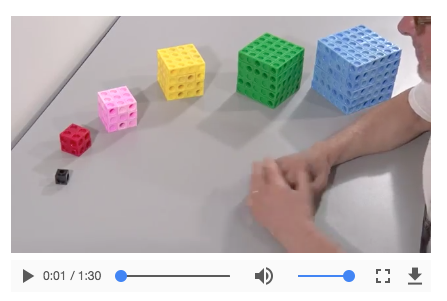 We have successive cubes – a 1x1x1 cube, a 2x2x2 cube etc. 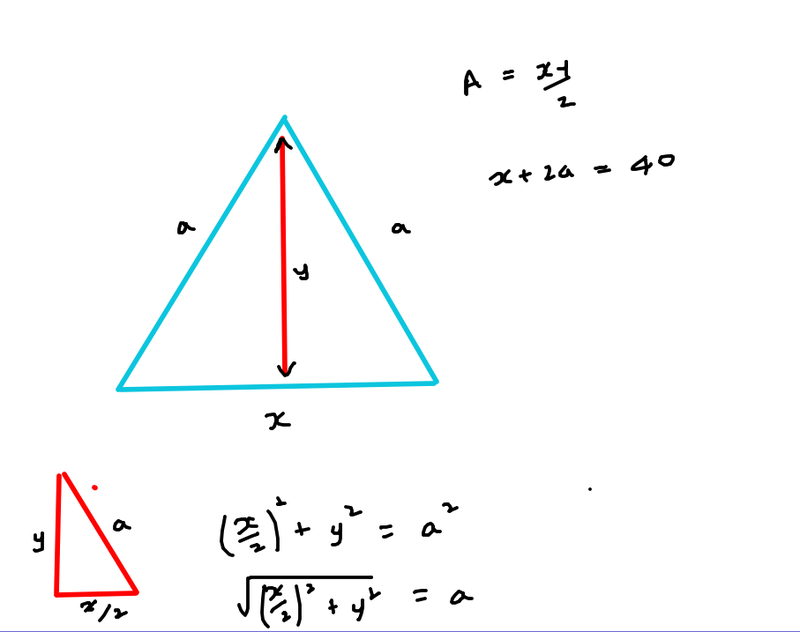 This is not an especially attractive relationship – but nevertheless we have discovered a mathematical relationship using the geometrical figures above. Next let’s see why the RHS is the same as the LHS. and we have shown that the RHS does indeed simplify to the LHS – as we would expect. 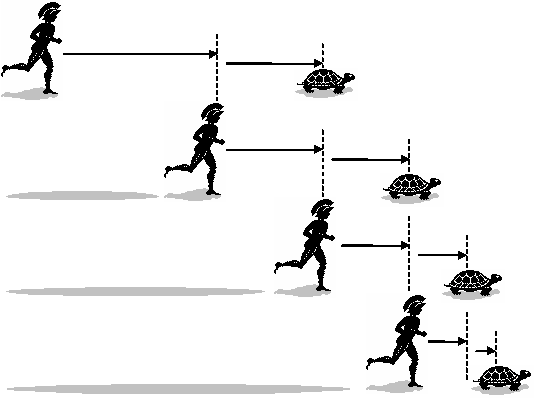 So there we go – a couple of different mathematical relationships derived from a simple geometric pattern – and been able to prove the second one (the first one would proceed in a similar manner). This sort of free-style pattern investigation where you see what maths you can find in a pattern could make an interesting maths IA topic. Here is a rule: “every card that has a D on one side has a 3 on the other.” Your task is to select all those cards, but only those cards, which you would have to turn over in order to discover whether or not the rule has been violated. Each card has a number on one side and a letter on the other. Give yourself a couple of minutes to work out what you think the answer is – and then highlight the space below where the answer is written in white text. We can see that here we would make a logical error if we concluded that all 4 legged animals were cats. In the logic puzzle we need to turn over only 2 cards, D and 7. This is surprising because most people will also say that you need to turn over card with a 3. 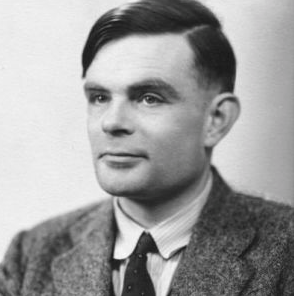 First we need to be clear about what we are trying to do: We want to find evidence that the rule we are given is false. 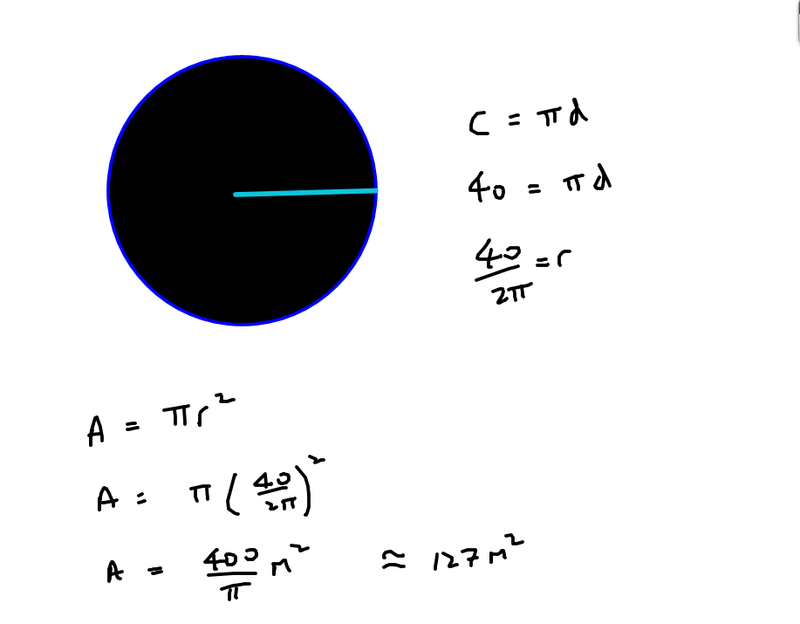 If we turn over the D and find a number other than 3, we have evidence that the rule is false – therefore we need to turn over D.
If we turn over the 7 and find a D on the other side, we have evidence that the rule is false – therefore we need to turn over the 7. But what about the 3? If we turn over the 3 and find a D then we have no evidence that the rule is false (which is what we are looking for). If we turn over the 3 and find another letter then this also gives us no evidence that the rule is false. After all our rule says that all Ds have 3s on the other side, but it doesn’t say that all 3s have Ds on the other side. 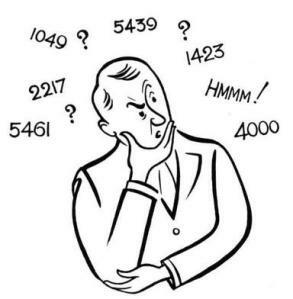 Are mathematicians better at this puzzle than historians? You can see that there is a significant difference between the groups. 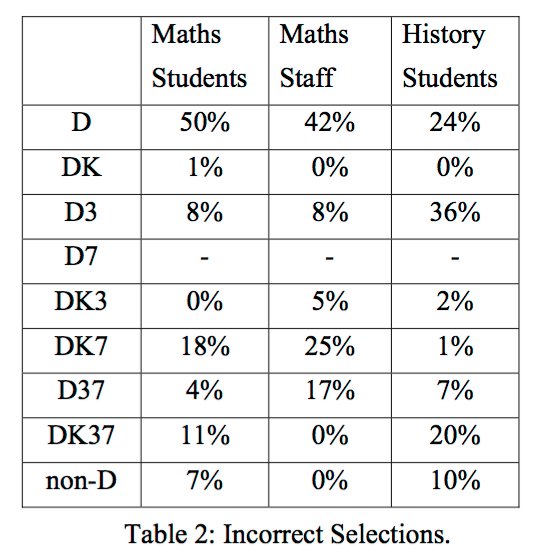 Maths students correctly guessed the answer D7 29% of the time, but only 8% of history students did. The maths university lecturers performed best – getting the answer right 43% of the time. 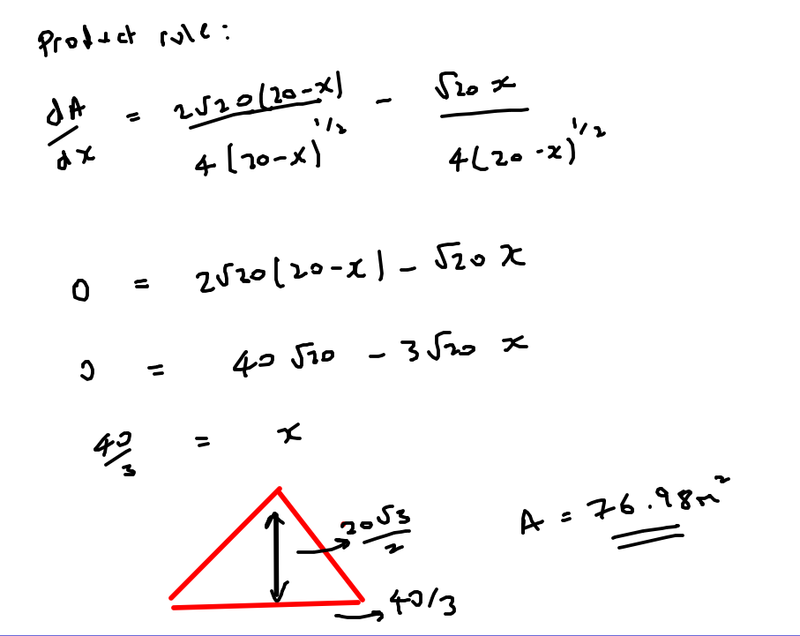 You can also analyse the mistakes that students made- by only looking at the proportions of incorrect selections. Here again are significant differences which show that the groups are thinking about the problem in different ways. 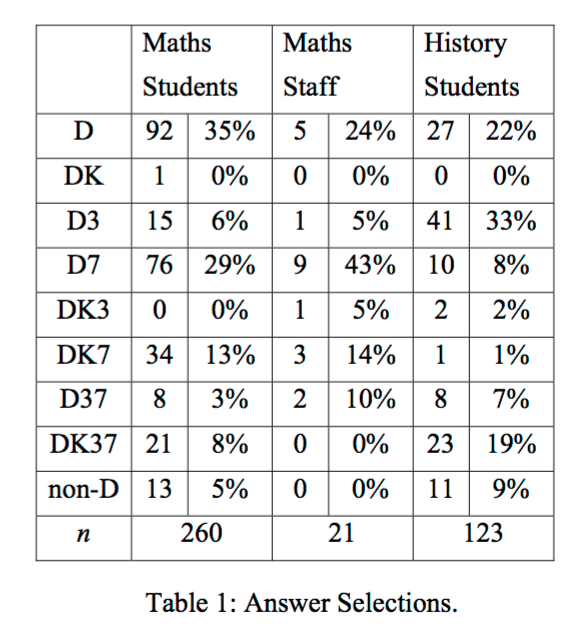 DK7 was chosen by around 1/5 of both maths students and lecturers, but by hardly any history students. 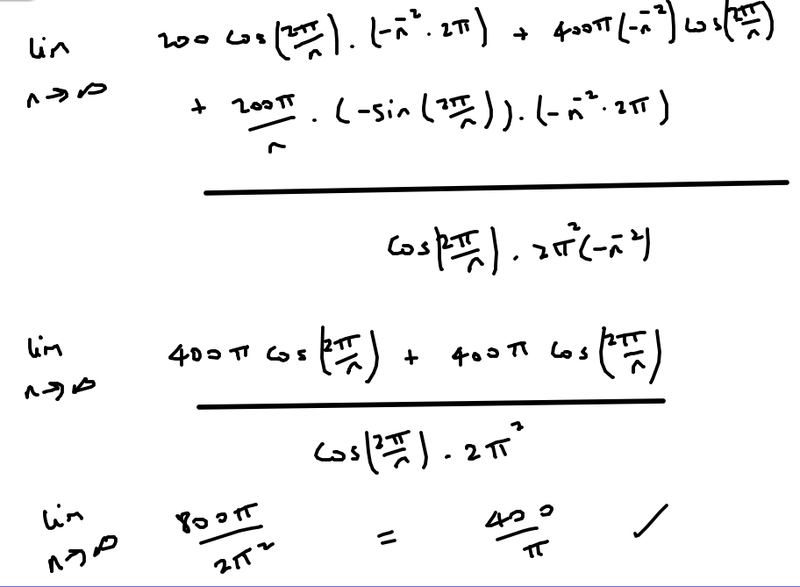 You can read about these results in much more depth in the following research paper Mathematicians and the Selection Task – where they also use Chi Squared testing for significance levels.